You will be given a reference e-book to read which has 128 pages And the test will be based on that e-book , you can take final test within 1 year of purchase. If you are one of those who are part of the healthcare industry and have been wanting to learn more about the ability of Six Sigma to take on the challenges related to running an organization in this specific industry, then it is advisable for you to first scrutinize the manner through which Six Sigma and other related improvement methods work and are deployed in a healthcare environment. It is also essential for you to determine the specific types of results materialized by the methodology, the specific factors that contribute a lot to its success and the future of a healthcare organization when Six Sigma is being implemented. Among the major reasons why healthcare organizations are now looking for certified Six Sigma Black Belt (CSSBB) and other professionals and experts in this methodology so that they can effectively implement this in their operations are the extreme pressures related to regulations, cost and quality that continue to mount in the industry. Six Sigma is proven to be a huge help in effectively addressing the most common challenges encountered by those who are part of the healthcare industry including technology optimization, resource utilization, throughput, length of stay, market growth and patient safety. The methodology also works in boosting leadership support and involvement, delivering the best results for all implemented projects, scoping and selecting projects as a means of achieving quality and financial results and establishing quantifiable objectives that can be aligned to the goals of a specific healthcare organization. 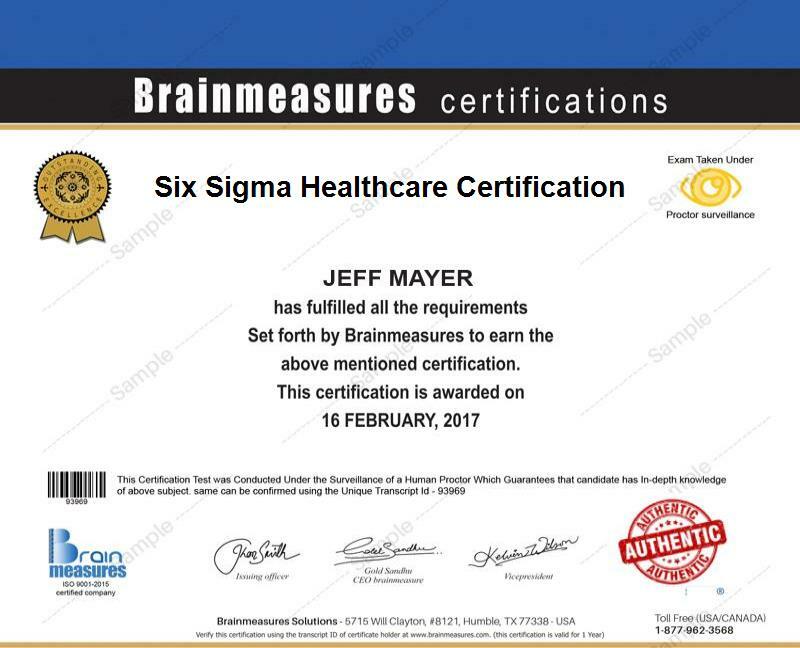 Brainmeasures Six Sigma for healthcare certification program is indeed the most highly recommended online certification program for you if you have a strong desire to become well-versed about the methodology so you can implement it in the operations of your healthcare organization. What makes this Six Sigma for healthcare course remarkable is that it was primarily developed by experts who understand well the needs of aspiring experts in this field to learn. It aims to offer the best Six Sigma for healthcare training which is guaranteed to work in your attempt to understand the healthcare industry, the major challenges that you need to face when running a healthcare organization or system, the major reasons why you need to apply Six Sigma in your operations and the different Six Sigma tools and strategies that you can use to make your organization or system stand out amidst competition. Deciding to acquire a certificate in this field from Brainmeasures can help in effectively representing your proficiency in this specific field. Why you need to implement the 4th pillar called standardize? The healthcare industry requires organizations with people who are greatly interested about providing quality services so expect the Six Sigma for healthcare certification program from Brainmeasures to continue showering numerous benefits to a lot of people. It targets medical directors, nursing directors, quality assurance directors, physician leaders, nurse executives, management teams and any other healthcare quality professionals who plan to use Six Sigma in their operations. Your Six Sigma for healthcare certification is also a huge help in your attempt to start earning an even bigger salary. As a holder of this Six Sigma for healthcare certification, you will find it easier to work as a Six Sigma for healthcare consultant and earn an average of $87,000 per year. Working as a Six Sigma for healthcare manager is also beneficial for you because it lets you receive an annual pay of $75,000 to $110,000.